Each analysis station is upgradeable from mesopore to micropore with its own transducers for current or future high-throughput needs. A single 3Flex with its minimal footprint and three configurable analysis stations eliminates costly investment in multiple instruments and additional bench space. Micropore ports include krypton capability for low surface area materials. A vapor option is also available. 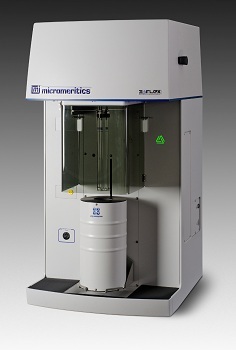 The 3Flex contains many design features that ensure superior performance and mark a major advancement in surface characterization instrumentation. Servo control for dosing and evacuation provides a higher degree of gas management and speeds the collection of data points through reduction of dosing overshoot. Pneumatically actuated, hard seal valves provide ultra-clean, leak free instrument operation. Stainless steel gas inlets, VCR fittings, manifold, and gaskets eliminate interference from contaminates and outgassing associated with elastomer seals and o-rings. These chemically resistive surfaces also allow the use of a greater selection of adsorptives. The 3Flex also boasts proven isothermal jacket technology and a new Dewar design that provide the many extended hours of continuous temperature control required when running long micropore analyses. The 3Flex also includes enhanced software capabilities, data reduction features, and instrument monitoring. An innovative dashboard monitors and provides convenient access to real-time instrument performance indicators and maintenance scheduling information. The intuitive MicroActive for 3Flex software gives the user the ability to interactively evaluate isotherm data and reduces the time required to obtain surface area and porosity results. User selectable data ranges through the graphic interface allows direct modeling for BET, t-plot, Langmuir, and DFT interpretation. It is not necessary to generate reports to view results - see it graphically and interactively on the screen.